In September 2016 Water UK published its Water Resources Long Term Planning Framework (2015-2065) report. Using new modelling techniques and a 50-year planning horizon, the report considered the impacts of climate change, population growth, environmental protection measures and water use trends on water availability. It identified that we are facing longer, more frequent droughts and more acute droughts in future than previously thought. 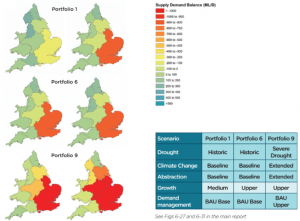 Although drought and water scarcity pressures will increase across England and Wales, the South East is particularly affected under a range of scenarios. The Waterwise Water Efficiency Strategy for the UK sets out a range of actions to respond to these pressures, through increased ambition on water efficiency. The Government’s 25 Year Plan further supports the need for water efficiency (read a blog post on that here). I attended the ‘Planning future water resources – South East’ regional consultation event on 18 April at Gatwick Airport. This provided a great opportunity to hear from all the companies in one location. In this blog post I summarise the water efficiency elements of their presentations and we encourage others to review the approaches on water efficiency and respond to the individual company plans. The Water Resources in the South East Group (WRSE) is an alliance of the six south east water companies, the Environment Agency, Ofwat, Consumer Council for Water, Natural England and Defra, to develop long term plans for securing water supplies in the south east. The Group’s aim is to develop a regional water resources strategy which will contain a range of options to find the best long term solutions for customers and the environment in the south east of England. Out of the three future scenarios, Future A is the most ambitious on water efficiency, reducing PCC to 110 litres per person per day by 2050. The report recognises the need for improved customer engagement in order to meet this demand reduction, with smart metering along with action from others on building regulations and ensuring new homes are water efficient.